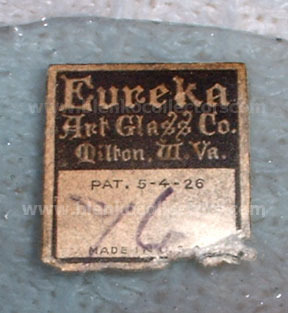 Eureka Art Glass Co.- These can only be found on stained glass and rondels. 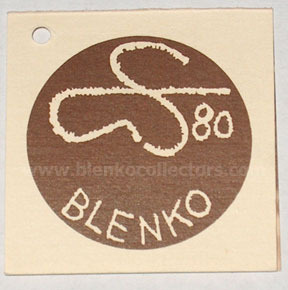 This is the paper label used for a short time during WWII. Then they went back to the Foil label. 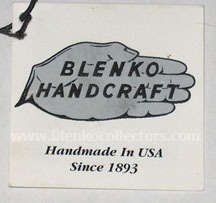 Silver Hand Sticker - Used from the 1930s to 1982. Left over stickers were used until they were gone. 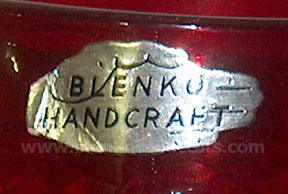 Hand signed Blenko - Used in early 1958. 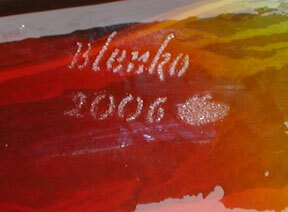 All of these were personally done by William Blenko, Jr.
All hand etches can only be found on 1958 designs. 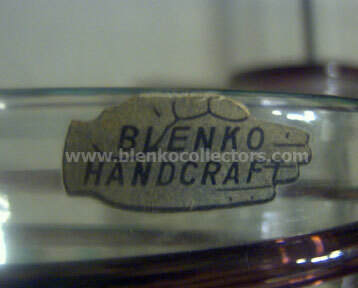 Sandblasted Blenko - Used from the Spring of 1958 to Summer of 1961. 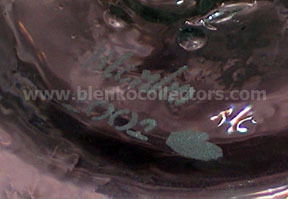 Don Shepherd signature found only on designer lines that were hand signed. 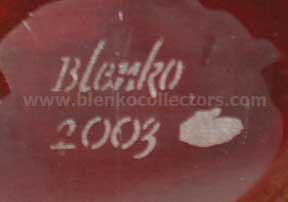 Blenko 2001 Stamp - In the Spring of 2001 Blenko experimented with a stamp to mark and date items. 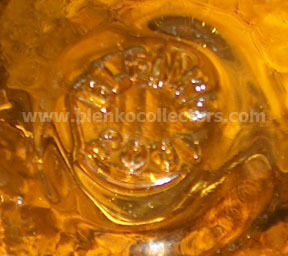 If anyone has this stamp on another piece feel free to email us a photo. 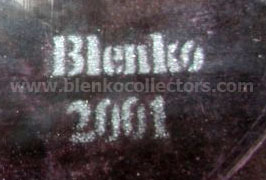 Blenko New Sandblasted Signature - Starting in July 2001 Blenko has a new sandblasted signature which includes the date of manufacture. 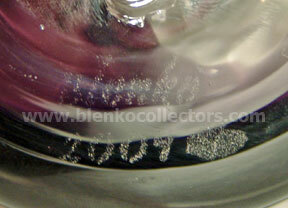 It is smaller than the older sandblasted. 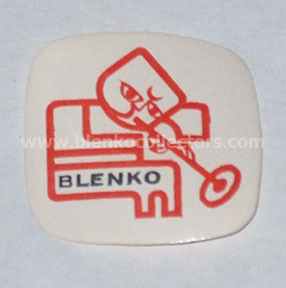 Block B Blenko Sticker - Used from 1982 to 1999. 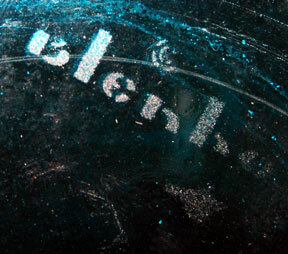 This label was designed by John Nickerson. The orange ball represents the hot glass ball on the end of the blow pipe. 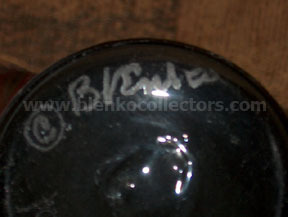 The line through the B is the pipe and the B is a mold. 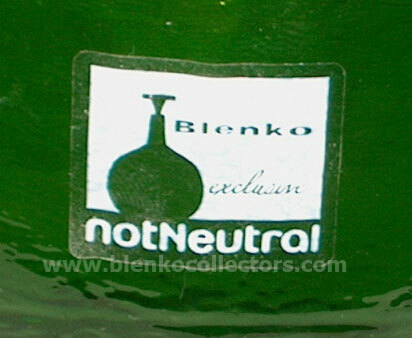 These stickers were also used until the supply was depleted. 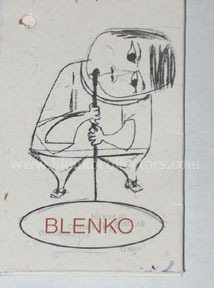 Little Blower Man Sticker - This sticker was designed to be used on the Regal, Raindrop and Rialto lines. 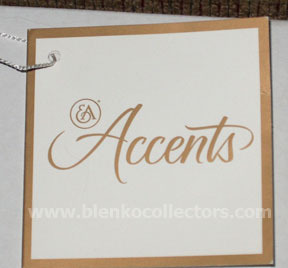 These can be found on other items but were intended for the above lines. 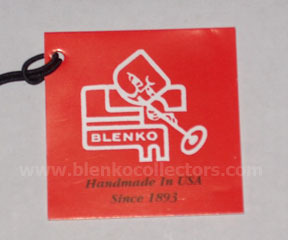 Blenko 2000 Sticker - This has the Blenko Company website and the Company phone number on it. Note: The 2000 sticker with the phone number and website is still being used today along with the sticker without the phone number and website and will be until supply is depleted. 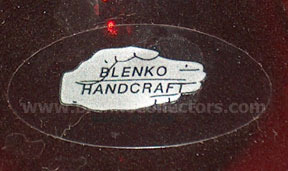 Blenko 2000 Sticker - Without the Blenko Company Website and Phone number. 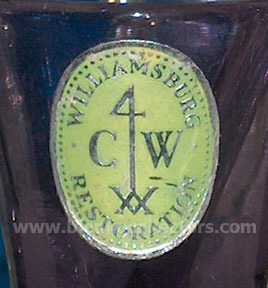 The Williamsburg Restoration Glassware Reproductions made by Blenko are the finest reproductions of eighteenth century glass. 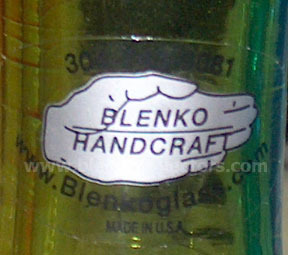 Blenko made them from 1936 until 1966. Royal Leerdam then received the contract. 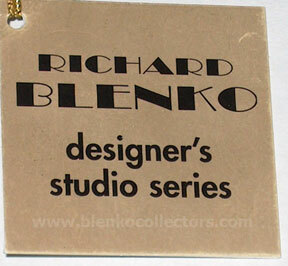 1980 Blenko Designer's Studio Series Hang Tag. This is the back only. 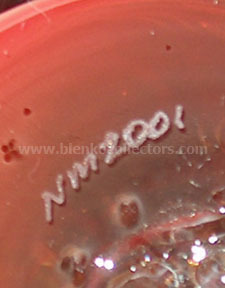 This was used on 2001 Neiman Marcus items among many others. On certain items and used during the mid to late 1990's. This was put on several designs, but nothing in particular. 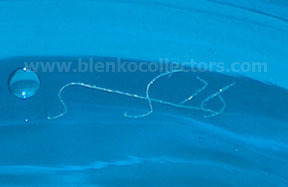 Used on all items sold through Ethan Allen. 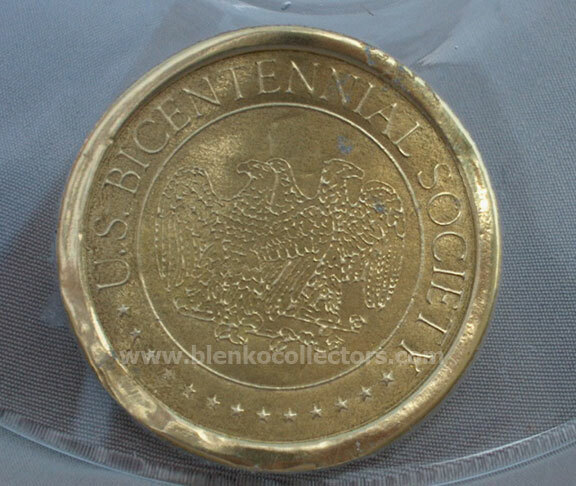 This sticker was only for Bicentennial pieces. 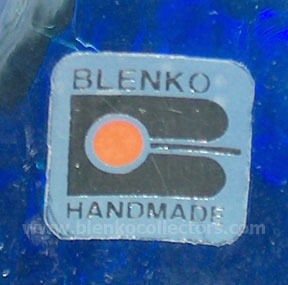 Some companies use their own stickers to mark the Blenko they sell. 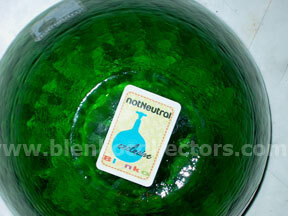 notNeutral is one of those companies.